Thursday morning bright & early, time for an interval session. Conor was over for this so off we went into Kilcornan to warm up before taking a speed session in through the woods. There is a nice 1000m loop which varies a little underfoot with a few twists and turns and a couple of little 'rampy' sections to throw a wobble into tired legs. 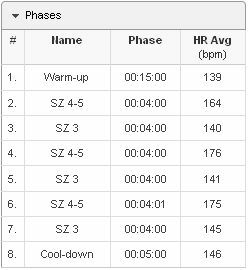 The Interval plan was 15mins Warm-up (Zone 2), 4mins 'On' (Zone 4/5) followed immediately by 4mins 'Off' (Zone 3), repeat this x3 times and then a 5min Cool-Down. What do Interval runs do? The main aim behind our use of interval sessions is to help with maintaining speed (hopefully develop some!) and to also keep the body system triggered for burning fat. Both of us could do with trimming some body weight before the marathon and hopefully keep it off over the winter. The session went well, with us covering 8k during the program. We tacked on a 3km easy pace to the end in order to add some distance to tired legs leaving a total of 11k. Now time for some recovery & breakfast! Keep it up men. Only barrier now is the weather !! Thanks Rick! Big session planned for tomorrow's interval.